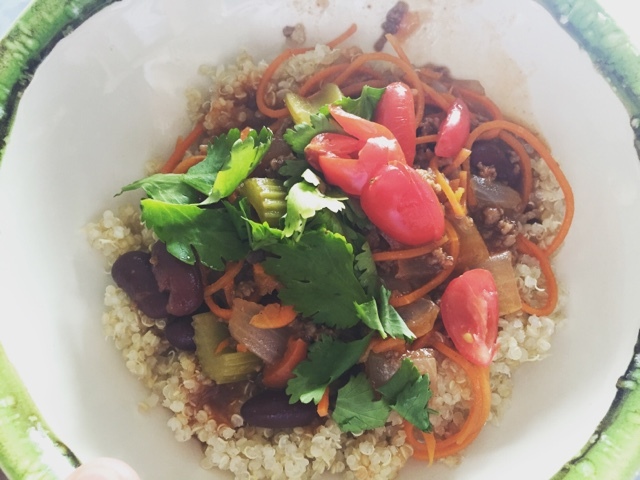 Inspiralized Chili Boss Bowl Goodness ~ Mommy Meowmeow! 1. 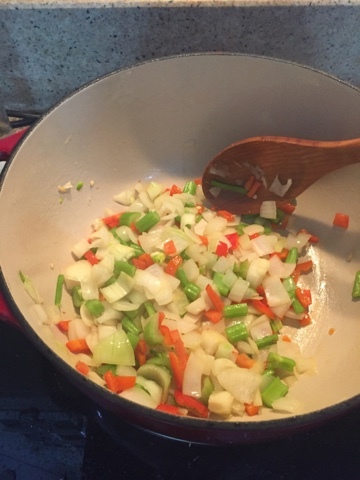 Heat 2 Tbsp of your nut oil and saute the onion, carrot & celery for approximately 3 minutes, until softened. 2. Add cumin, paprika, beef mince and cook until meat has browned for approx. 5 minutes. It looks so *EXTRA* hahaha..
3. 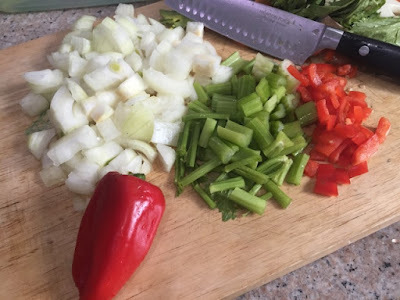 Add bell pepper, beans, tomato paste and puree (or spaghetti sauce). Pour in 4 cups of water and let it simmer for about 30 minutes until thick. 4. Season with salt & pepper and add in the cherry tomatoes. Since I made a big batch, I didn't add the tomatoes right away for the entire thing..just for the portion I will. 5. Before serving, fold in the cilantro (love this!!) and spinach. 6. Divvy into bowls, add some chopped chili or chili flakes and avocado. Also a squeeze of lime juice if you so prefer. I'm using Cuisinart's CTG-00-SPI Food Spiralizer which I purchased from Lander's Otis. When I was still shopping around, I would much have preferred the Paderno spiralizer as it has more blades / spiralizing options but it was a few thousands more expensive and I was not willing to shell out more money that time for a device I wasn't sure I'd get to use often. I learned to love Cuinart's spiralizer version because it's simple to use and not too cumbersome to clean up. Plus it also has a "catching bowl", if that's what it's called haha. 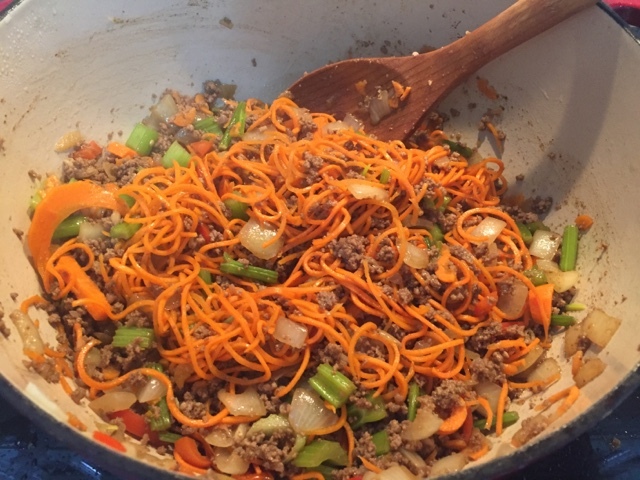 The only thing is that it only has 3 spiralizing options - thick julienne, thin julienne, and ribbon. That's okay though because it covers what I need to do. See how I do it in this short video. I used my phone's front camera so this video is showing the mirror image. 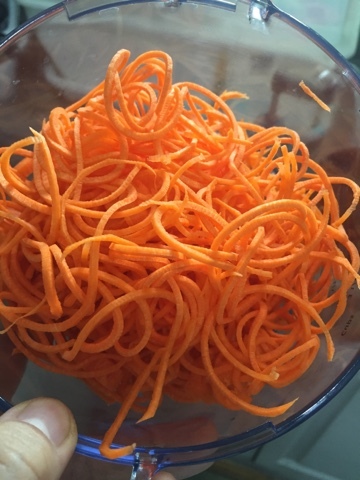 Spiralized carrots using the thin julienne setting. It does look like pasta, right? In order for me to support my blogging and social media activities, I may receive monetary compensation for links to products from this post, at absolutely no cost to you. However, I only recommend products that I personally love and use myself. What's your favorite activity? Here's mine..